Signups are open for the 2019/2020 Winter CSA Season. “Get it before it’s hot!” Reserve your spot before May 15th to qualify for a free Bounty Box in the fall. SIGN UPS ARE OPEN FOR THE 2019/2020 SEASON! 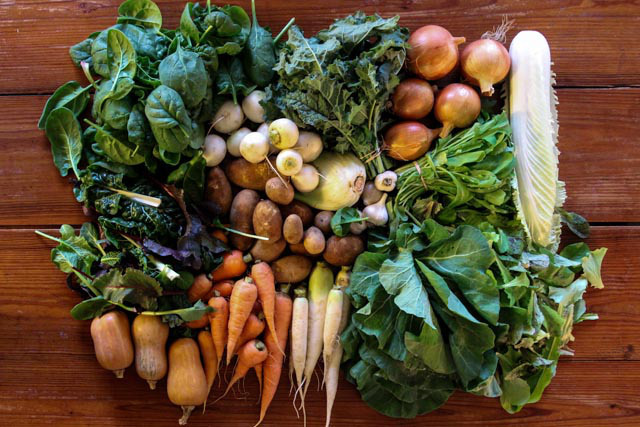 Our winter CSA program is the heart and soul of our farm. We strive to produce the highest quality seasonal produce for our members’ winter tables. 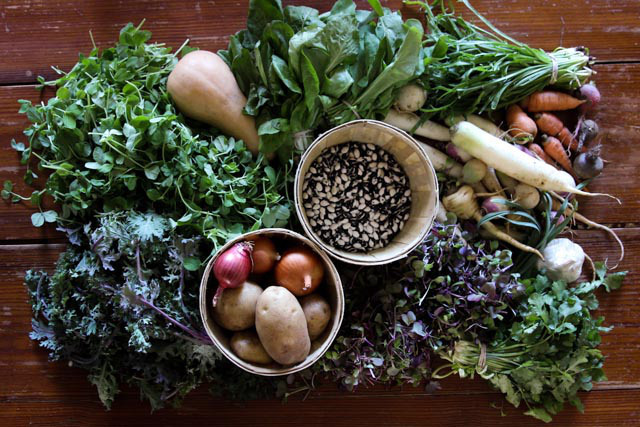 Our winter CSA program includes seasonal vegetables that can be grown successfully in the Northeast with as little additional fossil fuel energy as possible: roots, squashes, onions, cold hardy greens from our fields and high tunnels and greenhouse produced micro greens and shoots. Expect butternut squash, pumpkins, carrots, onions, garlic, 4 different kinds of kale, collards, chard, Chinese cabbage, mustard, potatoes, winter radishes, beets, and assorted salad mixes all harvested mostly from our fields. The harvest will change as the temperature drops and the amount of daylight decreases. While November and December will feature fresh bunched field greens, squash and onions, January and February will lean more towards greenhouse shoots and storage roots, and March will have more fresh greens from our greenhouse and high tunnels. Full Shares are $600. Expect 12-14 items at each distribution. About half the items are greens and half roots & other storage crops. An items could be a bunch of kale, 2 pounds of carrots, or a cabbage. We expect to provide our members with an abundance every two weeks – so be sure to have space in your fridge! Market Boxes are $350. Expect 5-7 items at each distribution. This is not a standard half share, rather meant for those who would like to cook a couple of meals each week using seasonal winter produce. It will contain mostly more popular vegetable items. Our winter CSA consists of 10 distributions which are scheduled starting the Saturday before Thanksgiving and continuing through March, with distributions every other week. Members choose a distribution site for the season, either on our farm in Kerhonkson, or at the Kingston Winter Market in Kingston, NY. Shares are available for the 2019/2020 Winter Season. To sign up use the form below. All members must read and agree to our member agreement and send a deposit of $100 to reserve a spot. We ask that all shares be picked up during the distribution window on Saturdays. Please view our member agreement here. 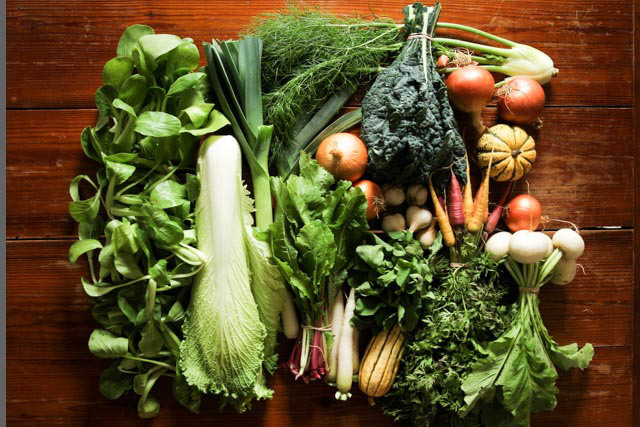 How did you learn about our winter CSA? I have read and agree to the member agreement. *Due to processing costs, we prefer check payments when possible. Please select your payment method and amount in this field. If you are paying by check, select your payment total, then hit the submit button, and mail in your check payment. If you are paying by credit card, select your payment total and proceed with the credit card payment portion of this form, below. You will receive a confirmation email after submitting this form.